Be sure to read today’s (2012/02/22) issue of The Star-Ledger to read Lisa Rose’s interview, see Jennifer Brown’s photographs, and hear our thought on the World’s Tallest Water Sphere. 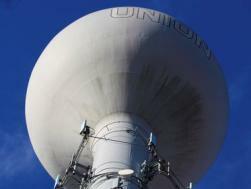 We marvel at and respect a new tall water tower in North Carolina, but there will always be a tattoo burned in our minds and hearts of Union’s water sphere. This entry was posted on Wednesday, February 22nd, 2012 at 4:51 pm	and is filed under Competitors, Editorial. You can follow any responses to this entry through the RSS 2.0 feed. Both comments and pings are currently closed.